You are here: Home / Infections / Refugees: which medical challenges we have to face? Refugees: which medical challenges we have to face? A potential danger due to a reactivation of latent tuberculosis infection is mentioned in the current epidemiological bulletin of the Robert Koch Institute (RKI). Could this lead to a problem – and which medical challenges we have to face else in relation to the refugee issue? We asked Dr. Rainer Löb, Federal Doctor of Malteser Germany. Mr. Löb, in Austria the refugees are tested on a random basis for tuberculosis. Is there a danger for the population? In Germany all refugees have to be screened for tuberculosis. Up till now there are only single occurrences, it is no mass phenomenon. There are some cases of malaria and chicken pox. Generally there are no increased health risks for the population. Due to the broad experiences with large scale operations and well trained medical teams, the Malteser in Germany are well equipped to cope with the present challenges. Malteser work along the lines of the specifications of Robert Koch Institute. Are there any diseases, which occur rarely in our countries? In fact there may be cases with more exotic diseases, which German doctors usually know only from medical treatises. Even so, that is still manageable. Much more numerous are usual diseases like colds or influenza. It is said that many refugees are not vaccinated against some diseases. How there is dealed with it? In most cases the refugees have no vaccination cards. Therefore Malteser use explanatory notes in 13 different languages to help the refugees to understand the need for vaccination. In the vast majority of cases the refugees agree with being vaccinated and the medical staff starts the vaccination process according the usual standards. The Malteser are known for their engagement to helping refugees. Where and to what extent employees and assistants are in action? Malteser are active in more than 130 places throughout Germany in the field of refugee relief. They care for more than 50.000 refugees daily. 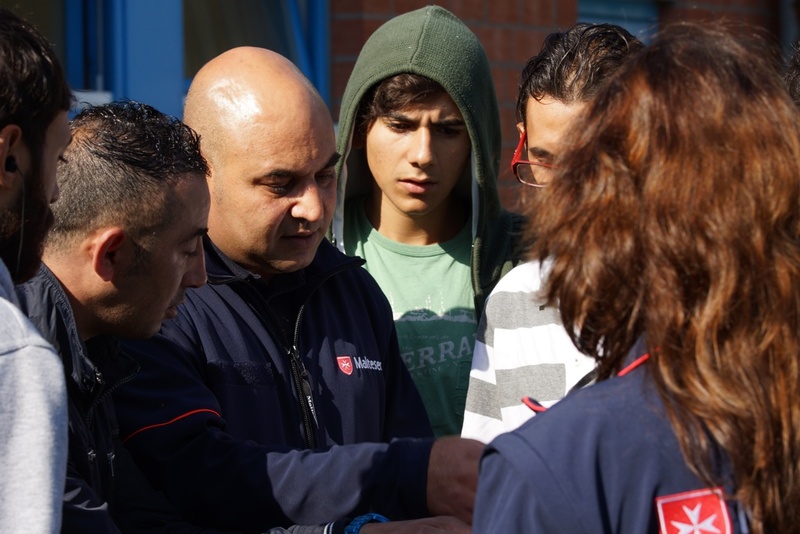 Over 1.500 professionals and 4.000 volunteers are working for the care of the refugees – every day. And this increases continuously. https://semmelweis.info/wp-content/uploads/2015/10/zvg_malteser.jpg 683 1024 Carola Timmel https://semmelweis.info/wp-content/uploads/2018/11/logo2.png Carola Timmel2015-10-19 09:11:262019-02-27 12:27:38Refugees: which medical challenges we have to face?